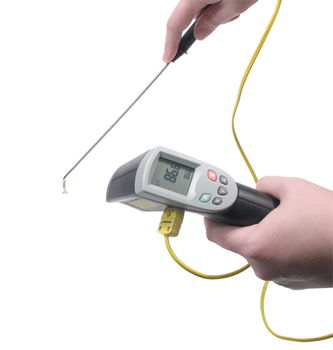 eSmart Technology: using an external Type K Thermocouple as a reference, the built-in software determines the emissivity of the target object, and automatically sets the emissivity of the target object, and automatically sets the emissivity of the instrument. Color Identification Signal Technology: display backlight changes to red when alarm setpoints are exceeded. Tripod Mount for hands free monitoring.